Initially it was the forbidden fruit that attracted me,” says 24-year-old Ankit Fadia who wrote his first book on ethical hacking when he was 14, studying in Class IX at Delhi’s DPS R K Puram. Till date he has authored 14 books on ethical hacking and the 15th one on how to hack into Windows Vista and Windows 7 is in the works. For the record Ankit’s first book The Unofficial Guide to Ethical Hacking has sold more than 7.5 million copies worldwide and is still counting. In simple terms hacking is all about gaining unauthorised entry into someone’s computer and either stealing confidential data or misusing the data for criminal activities,” explains Ankit from inside MTV’s Mumbai studio as he, in his new avatar, is co-hosting a 10-minute show What The Hack on the channel. And in his 11-year career as a consultant Ethical Hacker he has helped intelligence agencies and police across the world — including India’s after 26/11 terror attacks and serial bomb blasts in Ahmedabad in July 2008 — nail cyber crimes. “I’ve traveled to almost 50 countries across the world because of the nature of my job,” says Ankit. His ambition, though, is to travel to all the 195 countries in the world and he is sure he will do it one day. 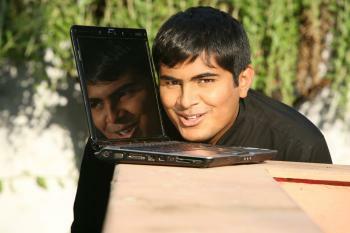 Today Ankit travels in India and abroad for more than 20 days in a month. His data card, laptop and blackberry act as his office. In an interview with Prasanna D Zore, Ankit talked about what attracted him to hacking, how he helps various government agencies crack cyber terrorism and what kind of career opportunities are available to ethical hackers. What attracted you to ethical hacking and when did you start? Initially it was the forbidden fruit that attracted me. I was always attracted to the power of being able to do things that most people could not or the power to access things that most people cannot. So I started hacking into a friend’s computer or snooped on their emails for fun. That’s how my love for hacking began. People always say that the forbidden fruit is always sweet. The more somebody discourages you from doing a thing the more you feel like doing it. That’s how it all began for me. Because of the success of my first book I realised that what was my hobby I could absolutely convert that into a profession as well. How did you manage to write your first book at 13? I got a computer at home when I was 10 and I got interested in computer hacking when I was 12. While I was learning the tricks of the trade I realised that in India there are no books or resources that can help one learn hacking. This kind of inspired me to write my first book on hacking when I was 14. The book sold 7.5 million copies and has got translated into 11 different languages. That was A one big milestone that kind of inspired me to turn my hobby into my profession. Was it very difficult for you to write at such a young age? It wasn’t very difficult actually. I had started my own Web site where I wrote I was writing tutorials on different computer hacking techniques and the feedback was very positive. My readers asked me to write a book on the subject. Then I decided to convert my tutorials into a book by adding more information. When I set to write a book I had not told any of my family or friends about it. When I finished it I called my mom and told her I have written a book on computer hacking. She thought I was playing a prank on her. Obviously, she believed me only when I showed her the manuscript. What was McMillan’s (the publisher fo his first book) first reaction when your mother told them that you wanted to publish a book? My mom told them that my son has written a book on computer hacking and we want to get it published. The person on the line asked her if I was a professor in a college. My mom told them that I was in school. The editor then asked if I was a teacher in the school. And my mom was like he’s studying in Class IX. The editors Sumesh Sharma and Joseph Mathai then asked my mom to bring the manuscript and author to their office to talk about the matter. Later Sumesh told me that when he received a call from my mother he thought somebody was playing a prank and he did not believe us. He thought that nobody would show up. I became the youngest author of a technical book in the history of McMillan’s authors worldwide. How did it feel after your first book was published? I felt good but I was only a small kid then. So I didn’t realise the consequences of failure or success. Till now I’ve written 14 books dealing with different topics on ethical hacking. My next book will be on how to hack into Microsoft Windows Vista and Windows 7. The fact that these two operating systems (OSs) were touted as the most secure is not true at all. You can hack into Windows Vista and Windows 7 pretty easily. What are the career opportunities that one can look at as an ethical hacker? Every company, irrespective of what they do, need to have ethical hackers. The maximum demand for ethical hackers comes from financial institutions and banks. They are also high in demand from the IT companies, BPOs, KPOs and LPOs. Telecommunication companies also hire them. Hotels, aviation companies, retailers all of them need ethical hackers to prevent misuse of data as well as online credit card transactions. Interestingly, most of these industries have been hiring ethical hackers in good numbers to protect their information systems and infrastructure. As far as remuneration is concerned those who work full time are paid monthly salaries and those who work as consultants are paid on a per-day, per-hour basis. However, consultants make more money than employees as ethical hackers but then it also depends on your skills and value add. The starting salaries range for ethical hackers in India is between Rs 25,000 to Rs 35,000 per month and outside of India US $ 50,000 to 90,000 per year. Also, most companies don’t advertise for ethical hackers because the word hacker still carries some stigma. Companies post advertisements for network engineers, system administrators or network specialists. Lots and lots of my students write to me saying that they have been hired by big companies as such but what they actually do is work as ethical hackers. What are the courses that you offer that can help people get jobs as cyber security professionals? We have a one-month certified course called AFCEHC available at all Reliance World outlets that will cost you around Rs 6,999. We also have a one-year postgraduate diploma course on cyber security that is India’s first government accredited/approved certified course with IMT Ghaziabad as my partner. The fee for this distance-learning course is Rs 37,000 per year. Then there is the two-year master’s degree course in cyber law and cyber security. You have authored 14 books at 24, with the first one selling more than 7.5 million copies and you also act as a consultant. Can you tell us your net worth? How much do you earn in a year? It was a lot when I was 13, it’s a lot more at 24. This entry was posted in Uncategorized and tagged brilliant student, computer, ethical hacker, hacking, indian children, indian kids, indian youth, inspire people, inspiring children, inspiring kids, inspiring student, Software Engineer, student, young computer engineer. Bookmark the permalink. its amazing!!!! u’ve inspired me!!! and i’m now interestd n involving myself into hacking!!! I respect you for what you have achieved. Is there any way you could email me any free courses to learn what you have learned. Unfortunately I do not have the finances to put myself through college. Any response from you would be much appreciated. Visit this website for detailed info about his courses. Thanx so much for responding promptly,I will have a good browse round your site. Nice photo’s.